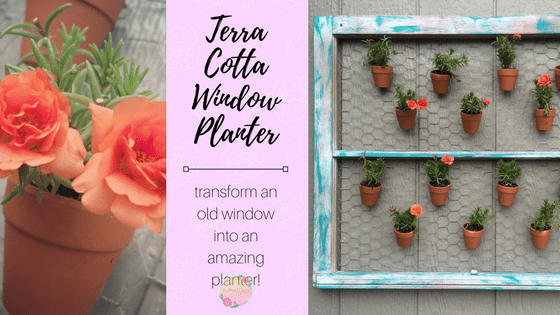 This is the perfect project to start over the weekend and have flowers growing all year! 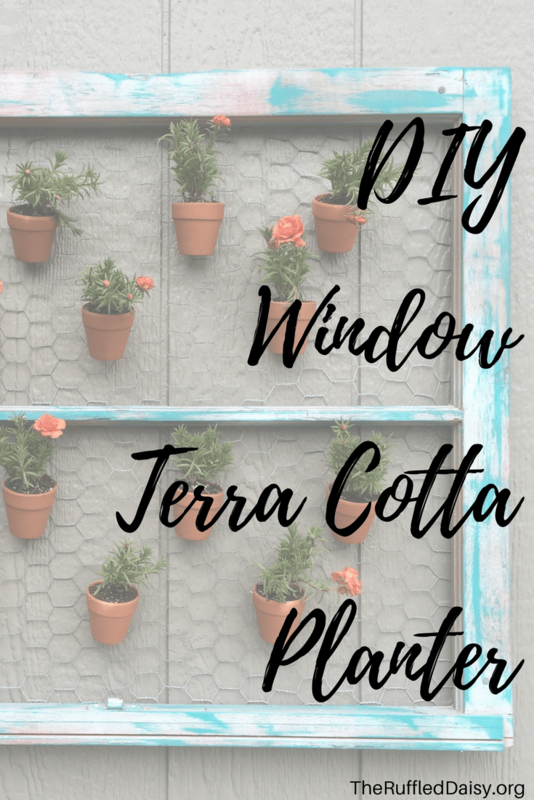 This Terra Cotta Window Planter is the perfect addition to any backyard garden area. You need an old window without the glass (if you are breaking out the glass yourself, be careful and make sure that you remove the glazing pins). I already had one that was missing glass. SCORE!! Here’s where you can get really creative – paint it whatever color you want. This one already had some color on it so I just dry brushed some of the best color EVER….TEAL!! Next, you’ll grab some chicken wire and use a heavy duty stapler to attach it to the back of the frame. I would recommend using leather gloves to attach the chicken wire as it can be very sharp. Use caution. Once that’s attached, you’re going to need some little terra cotta planters. You can use whatever size you would like based on your personal preference. I used THESE. You can also click the pic and it will take you right to the amazon link to purchase them. You’re gonna get 6 of them for $12. You may only need 6 depending on the size of your window frame. As you can see from the above pic, the pots have a small hole in the bottom. I ran a thin piece of wire through that hole and onto a link in the chicken wire and then just twisted it to attach it. Super easy!! Add some flowers that like the heat and you’re ready to display it! I live in Kansas and I used Rose Moss. These are the most delicate looking flowers ever and they don’t need alot of watering since they’re in the succulent family. These are small pots so they will dry out quickly. Just keep that in mind when planning your flowers. PIN this image below and share with your friends! What are some outdoor projects that you have been working on? I love projects that I can refurbish old things and make new things with them. This was the perfect project!